Get great deals anytime and use it later or give it as a gift! Prior to finalizing your pampering spa service purchase please review our spa policy regarding refunds and adjustments. View our Spa Policies. Services/packages are non-refundable. All products sales are final. We remove old gel and replace it with fresh, tapered pink gel. Nails can be extended for extra length. The entire nail is cured under a UV light. No Acrylic Fumes! Nails are light but strong, and shaped to perfection. Can be finished with traditional polish or Gel Polish for a flawless shine and quick drying time. Addtl. $10 cost applies. Enjoy professional nail tips which look like a natural nail. Tips are blended into the natural nail and then overlayed with a clear or pink classic gel. The entire nail is cured under a UV light. Moisturizing hand treatment included with service. The perfect solution to nails that possess sufficient length but require some additional strength. A thin, clear or natural pink gel overlay is brushed over the entire nail. and cured under a UV light. Nails are light but strong, shiny and shaped to perfection. Polish with your favorite lacquer. Moisturizing hand treatment included. The perfect solution to nails that possess sufficient length but require some additional strength. A thin, dual colored gel overlay is brushed over the entire nail. and cured under a UV light. Nails are light but strong, shiny and shaped to perfection. Moisturizing hand treatment included. Finished with super shine gel polish for a flawless finish and quick drying. The perfect solution to nails that require extra length and strength. A tapered, natural pink gel overlay is brushed over the entire nail and cured under UV light. Nails are light, strong and shaped to perfection. Shiny finish is most requested, but a matt finish holds polish better. Moisturizing hand treatment included with service. The perfect solution to nails that require extra length and strength. A tapered, natural pink gel overlay is brushed over the entire nail and cured under a UV light. Nails are light, strong, and shaped to perfection. Shiny finish is most requested, but a matt finish holds polish better. Moisturizing hand treatment included with service. The entire nail is re-leveled with one tone product to ensure nail smoothness, wth no fill lines. Moisturizing hand massage is included with your nail service. 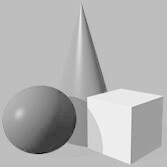 Replacements incur addtl. charge. 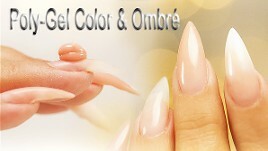 The enitre nail is re-leveled with Pink & White (French look) gels Tthe tip with white gel and pink for the base area. Moisturizing hand massage is included with your nail service. Replacements incur addtl. charge. A revolutionary process of creating gorgeous and superior strength to exisiting natural nails. Perfect for those who love the look and feel of Classic Gel Nails, but require more solid strength. A tapered, naturally colored poly-gel is created to the desired length and shape of the nails. Once cured under a LED light, the nails are durable, light weight, but strong. You can also make the nails a solid pink semi-opaque color to eliminate the need for polish of any kind. A revolutionary process of creating gorgeous and superior strength to exisiting natural nails. Perfect for those who love the look of Pink & White (French look) Classic Gel Nails, but require more solid strength. A tapered, dual colored poly-gel is created to the desired length and shape of the nails. Once cured under a LED light, the nails are durable, light weight, but strong. You can also make the nails a solid pink semi-opaque color to eliminate the need for polish of any kind. Sealed with super shine finishing Gel. Moisturizing hand treatment included with service. The perfect solution to nails that possess sufficient length but require some additional strength. A thin, clear or natural pink gel overlay is floated over the entire nail. Once cured under a LED light nails are light but strong, shiny and shaped to perfection. Polish with your favorite lacquer. Moisturizing hand treatment included with service. The perfect solution to nails that possess sufficient length but require some additional strength. A thin, dual colored (pink & whiite) gels overlay is floated over the entire nail. Once cured under a LED light. Nails are light but strong, shiny and shaped to perfection. Polish with your favorite lacquer. Moisturizing hand treatment included with service. A revolutionary process of rebalancing and filling in your gorgeous poly-gel nails. Perfect for those who love the look and feel of Classic Gel Nails, but require more solid strength. A tapered, naturally colored poly-gel is created to the desired length and shape of the nails. Once cured under a LED Light the nails are durable, light weight, but strong. You can also make the nails a semi-opaque color to eliminate imperfections in the nail. A revolutionary process of rebalancing and filling in your gorgeous Pink & White (French look) nails. A process that bestows superior beauty & strength! Perfect for those who love the look and feel of Classic Gel Nails, but require more solid strength. A tapered and dual colored french poly-gels create the desired look, length and shape of the nails. Once cured under a LED Light the nails are durable, light weight, but strong. You can also make the nails a semi-opaque color to eliminate imperections in the nail. The best of two worlds. We first create a free form nail using a natural colored acrylic and overlay a clear sculpting gel ensuring product resilience and durability. Moisturizing hand treatment included with this nail service. Replacements incur addtl. charge. A free form is used to create a nail using pink & white Acrylic and then overlayed with clear sculpting gel ensuring product resilience and durability. Finished with Super Shine Gel Polish. Moisturizing hand treatment included with this nail service. Replacements incur addtl. charge. The best of two worlds. Nails are re-leveled with natural colored acrylic and an overlay of sculpting gel ensuring product resilience and durability. Moisturizing hand treatment included with this nail service. Replacements incur addtl. charge. The best of two worlds. Nails are re-leveled with a pink & white acrylic technique and then overlayed with clear sculpting gel ensuring product resilience and durability. Finished with Super Shine Gel Polish. Moisturizing hand treatment included with this nail service. Replacements incur addtl. charge.